GEORGETOWN, S.C. — For years, the traditional method of installing or replacing a screen porch has been to attach small tacks, nails or staples to the porch posts and railings to secure the screen. Small narrow painted wood battens or lattice served as trim and was nailed over the tacks or staples to conceal the seams and fasteners. Each time the screen has to be repaired, the battens or lattice were removed and normally replaced. A few years ago, a remodeling contractor in the Southeast was convinced that there had to be a better way to design, install and maintain screen porches. As a result, the contractor developed and patented what has become the Screen Tight™ Extruded Aluminum Porch Screening System that is gaining in popularity among Do-it- Yourself homeowners, handymen, professional builders and remodelers as the best new and economical way to screen a porch, enclose a deck, breezeway or gazebo. Unlike traditional screening, the channels of the Screen Tight system completely hide the clip fasteners for a clean elegant look, and allow for different configurations including a railing system, vertical mill posts and horizontal rails. 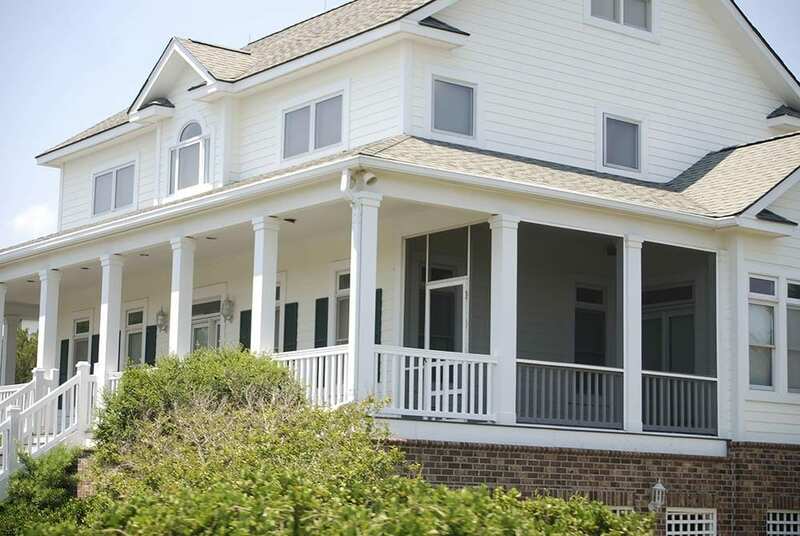 The Screen Tight™ Porch Screening System combines the maintenance-free quantities of vinyl with the proven method of spline screening and allows users to screen from the interior or exterior of the porch using a flat spline in less time. Among systems available from Screen Tight are the recently introduced MINItrack™ and FASTtrack™ Aluminum Porch Screening Systems that supplement Screen Tight’s original system. Update: Screen Tight now has 6 Screen Porch Systems. MINItrack™ is a smaller profile system that is perfect for second floor applications. FASTtrack™ is a little larger is size and mostly used for first floor ground level applications. The modular design of FASTtrack™ also gives the user the ability to put two pieces together to make a railing. You can’t do this with MINItrack™. All exposed materials are made from weather-proof, UV-resistant window grade vinyl. The systems consist of base and cap components that come in widths of 1.5 in. and 3.5 in. and are stocked in 8 ft. lengths. The caps are also available in 10 ft and 12 ft lengths and come in white, beige, gray and brown. Screen Tight systems are easy to install and make repairs, very forgiving, low in maintenance due to their UV protected vinyl, and require no painting or mitering. They are cost efficient, can be installed on a weekend, very economical for home improvement or remodeling and well suited for most screen porches. The systems come with a 5-year warranty. Shown here is a combination of the FASTrack™ and MINITrack systems. FASTrack™ is a little larger is size than MINItrack™. The modular design of FASTtrack™ also gives the user the ability to put two pieces together to make a railing. You can’t do this with MINItrack™. The systems have been installed in millions of homes and commercial properties throughout the United States and Canada. Systems are available in lumberyards, hardware stores, home centers and independent distributors. Screen Tight systems are easy to install and make repairs, very forgiving, low in maintenance due to their UV protected vinyl, and require no painting or mitering. They are cost efficient, can be installed on a weekend, very economical for home improvement or remodeling and well suited for most screen porches. The systems come with a 5-year warranty. The only tools required are a screen roller and spline, a mallet for snapping the cap into place, a utility knife, a standard snip or chop saw and a drill for attaching to the base. Attach the clips to the existing 2 x 2 or 4 x 4 in. wooden frame 2 inches from the corners and evenly spaced 10 in. apart. Cut the extruded channels to desired length and snap over the clip using a rubber mallet, installing the vertical channels first. Both the base and cap components can be cut with a Screen Tight Pro-Rollerknife™ or a standard spline roller. Mate the channels to the post and snap them over the clips. Roll the screen into the spline and attach using the roller knife. Any excesss screen is cut and removed. The caps temporarily pop off for quick and easy replacement when re-screening. According to Screen Tight, fiberglass or aluminum screen works best with the system. Overall cost averages $1.00 a square foot of opening for MINITrack™ and $2.00 a square foot of opening for FASTtrack™. Contractor Steve Donnelly of Hartsville, TN, who used the MINItrack system for a lake house, noted that the installation was very easy because the screen tightened as he rolled the spline into the spline grooves. It took Donnelly and one assistant a little over 24 hours to install a porch that went around three sides of the over 1,900 square foot house. “I am so glad that I found it, it was so easy to use.” Donnelly said. Brett Keiper is a DIY Nashville-area resident installed the MINItrack system himself transforming his awning covered patio into a screen porch. He found that the ScreenTight™ directions were straightforward and like Donnelly found the system easy to install. “I like it that the fasteners are hidden resulting in a clean installation,” noted Keiper. “The channels are small and hidden and it looks clean and non-obtrusive. People always tell me how great it looks and we couldn’t be happier. Formed over 20 years ago, Screen Tight™ is well recognized as the leading Innovator in the outdoor screen industry. The company re-invented the method of attaching screens for outdoor areas and redefined the screen door market by inventing and introducing its patented solid vinyl screen door. Screen Tight™ also offers a patented Wrap N’ Snap™ Column Wrap to dress up structural columns, solid foam PVC, metal and wood screen doors, plus a variety of products using advanced composite co-extrusion technology. This entry was posted in News and tagged Original Screen Tight System.